After publishing this announcement, I just found an article that Marian wrote today about this webinar. It's a great read. Click here for the article. In it, she wrote, "If this is about Geoff's family why should I bother watching it? Great question! Yes, this is about Geoff's ancestor but it is really about the process of solving brick walls and then proving or confirming what you have found. It's real practical advice for any genealogist or family historian who has a brick wall to solve." If your ancestor looks more like their tombstone than their mug shot, read on. In the image above Cora Crosby's tombstone appears in the pedigree chart. This can happen for two reasons. First, the tombstone picture may be marked as the preferred picture in her Individual Picture Gallery. Notice the asterisk next to the number two below. Because this is marked as the preferred picture, it will be the one to print on charts and reports. To fix this, click on the desired picture, then click on the Asterisk button (in the upper right, next to the Close button). Second, the tombstone picture may be the only picture you have of the person. If you linked it to the Individual's Picture Gallery as in the example below, it will be the one to print on your charts (as shown in the pedigree chart above). This picture really should be linked to the Burial Picture Gallery. To do so, first, right-click on the tombstone picture and click on Cut. Then, click on the drop-down menu and select Burial. This will open the person's Burial Picture Gallery. Finally, right-click in an available picture slot and select Paste from Legacy Clipboard. The tombstone picture will now be properly linked to the Burial Picture Gallery. This was demonstrated in our recent "Watch Geoff Live: Cemeteries" webinar. Or, since today is Halloween, maybe you want to create a chart of all tombstones. Up to you. Free webinar now online - "Watch Geoff Live: Cemeteries"
Attend the first-ever RootsTech Genealogy Idol competition as four contestants - 2 live and 2 online - compete for your votes. In the three rounds of competition, contestants will demonstration their gen-tech expertise and try to woo you with their favorite gen-tech secrets. Everyone will learn – but only one will leave with the title of RootsTech Genealogy Idol. The competition will also be broadcast to a live webinar audience who will cast their votes for the winner. I'll publish more information soon and also invite you, our Legacy News audience, to submit proposals to participate in this class. Below is more information about the conference. Don’t Miss the $129 Early Bird Registration for RootsTech 2012 in Salt Lake City! If you were one of the thousands of people to attend the inaugural RootsTech Conference in Salt Lake City, Utah, in 2011, you already know it is an event you do not want to miss in 2012! From groundbreaking topics, “unconferencing discussions”, to the RootsTech Playground, this conference will continue to deliver in its uniqueness. Think major technology creators (Dell, Microsoft, Oracle, FamilySearch, brightsolid, Ancestry.com, Archives) and technology users (genealogists and family history buffs) coming together in a fun, collaborative environment for three days to learn new, technology-based skills and help influence the future of family history through technology! Go to RootsTech.org now to see the full list of topics and sessions. $35 student rate (Must show a current student ID at admission). The RootsTech conference is sponsored by Oracle, Microsoft, Dell, FamilySearch, Brigham Young University, the New England Historic Genealogical Society, brightsolid, Archives.com, Ancestry.com, the Association of Professional Genealogists, the Federation of Genealogical Societies, and the National Genealogical Society. GenealogyBank.com, a division of NewsBank, is one of the largest and fastest-growing searchable newspaper archives online for family history research. More than 1 billion genealogy records have been added to the site since it launched five years ago, to help people discover, preserve and share their family history. The website also provides access to hard-to-find pension lists, military records, land claims, and other helpful genealogy records including free access to the Social Security Death Index. Special Offer for Legacy News readers – Join Now and Save 25%! There’s never been a better time to explore your family history on GenealogyBank.com. Join before October 31st, 2011 for only $4.37 per month, you’ll save over 25% off the annual subscription (Now $52.46 – Was $69.95). You can also subscribe by phone 1-866-223-8535 (M-F 10 am-7pm EST) mention product code 1109L. You are just a few clicks away from fascinating facts and stories from your family’s past. Thousands of Legacy Family Tree users have relied on our Legacy News blog to bring them the latest genealogy news, Legacy tricks, and technology tips. In fact, many of you have been begging us to compile, categorize, index and publish the past six years of articles so you can have a complete guide in one place. Your wait is over. 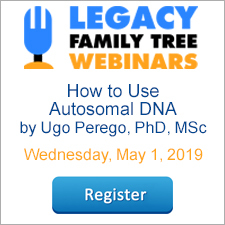 You now have The Official Unofficial Guide to Using Legacy Family Tree: Plus Research Advice, News, Views, and Technology Tips at your fingertips. There are some books that are meant for the coffee table, but this book, written by Legacy's own Geoff Rasmussen, belongs with you at your computer. 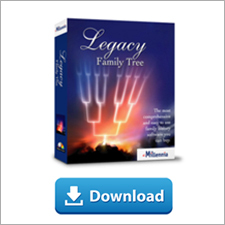 From the very first page you will notice that this book is much more than a boring instructional manual – it is full of real-life examples that not only teach you the right buttons to push, but it thoroughly explains how to get the most out of your favorite genealogy software program – Legacy Family Tree. You will also learn about the latest genealogy technologies, methods of organizing your paper files, and read inspirational stories that can help lead you to one Genealogy Happy Dance after another. After graduating with his genealogy degree, Geoff thought his days of endless writing were finally over. Little did he know how much he would enjoy writing these articles for our Legacy News blog. Each article in this book includes a link back to the original article on the blog so you can read all of the comments left by others, or add your own. Click here to preview the Table of Contents, the complete index, and a few selections from the book (23 pages).